Rhodococcus equi (R.equi) and Lawsonia intracellularis. No veterinary approved products available. Clarithromycin and Rifampin are commerically available separately but not as a combination. Clarithromycin is one of the newer macrolide antibiotics. Like other macrolide antibiotics, clarithromycin generally is bacteriostatic and works by inhibiting protein synthesis within susceptible bacteria. Clarithromycin is well absorbed orally. Macrolide antibiotics are not used in horses older than one year of age due to severe, potentially fatal colitis. Rifampin is either a bacteriostatic or bactericidal antibiotic that inhibits DNA-dependent RNA polymerase in susceptible bacteria. It is well absorbed from the GI tract and penetrates many bodily tissues, including the cerebral spinal fluid. Rifampin is combined with other antibiotics to treat difficult walled-off infections because it increases the penetration of antibiotics into abscesses. It is always used in combination with other antibiotics because resistance develops rapidly when it is used alone. Rifampin is highly protein-bound and is metabolized by the liver. Clarithromycin combined with rifampin is used in foals primarily for the treatment R.equi infection. For many years erythromycin combined with rifampin was the standard of care to treat R.equi infections. Recently, the newer advanced generation macrolides, such as clarithromycin and azithromycin, have gained popularity due to their better absorption and penetration characteristics. Research indicates that clarithromycin concentrates in pulmonary epithelial lining fluid (PELF) and in bronchial alveolar (BAL) cells of foals. Antibiotic levels for oral clarithromycin exceed the minimum inhibitory concentration in the PELF and BAL for a full 12 hours. 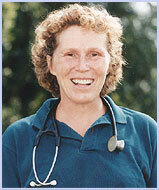 Research performed by Giguere at the University of Florida concluded that foals treated with the combination of clarithromycin and rifampin exhibited significantly better radiographic improvement and, overall, had better short term and long term treatment success when compared to those treated with azithromycin/rifampin, or erythromycin/rifampin combinations. The treatment success-rate for foals with severe radiographic-lesions was greater than 80%. Clarithromycin combined with rifampin may be used to treat em>Lawsonia intracellularis in foals. Older horses generally are treated either with tetracyclines, chloramphenicol, metronidazole, or other antibiotics. The most-common side effects in all species are gastrointestinal. Mild to moderate diarrhea may occur in foals. Hyperthermia is a serious and potentially fatal side-effect that may be seen in foals. There is ample clinical evidence that foals on erythromycin are very sensitive to heat and possibly to bright sunlight and there have been anecdotal reports of similar hyperthermia with both clarithromycin and azithromycin. Because of this problem, many veterinarians do not turn out foals on macrolide antibiotics in the daytime and may severely limit their turnout time in general. Should hyperthermia occur, aggressive cooling using water and fans or air conditioning is helpful. Clarithromycin/Rifampin should be used with caution in animals with decreased liver-function. Rifampin always is used in combination with other antibiotics, as resistance will develop if used as mono therapy. Rifampin may cause a harmless red/orange discoloration of urine, tears or sweat. Clarithromycin has a number of potential drug interactions when used in animals other than foals with R. equi infections. If using this drug in other species, other drug interactions may occur. In foals, interaction of omeprazole and clarithromycin may increase levels of each drug. Rifampin induces the liver microsomal enzymes. The metabolism of the following drugs may hypothetically be affected: barbiturates, benzodiazepine and corticosteroids. Overdose of any macrolide antibiotic can cause severe GI side effects. Some veterinarians use oral probiotics in foals being treated with macrolide antibiotics in an attempt to decrease the likelihood or severity of antibiotic induced diarrhea.